I graduated from Baddeck Academy in 1998. After graduating from Acadia University with a Bachelor of Science degree but no job prospects, I had to decide what I wanted to pursue. Since I like computer work, but also enjoy working outside, and I love working with new technologies, I enrolled at NSCC’s Centre of Geographic Sciences in Lawrencetown, NS which specializes in Geomatics related fields of study. There I received an Advanced Diploma in Remote Sensing. 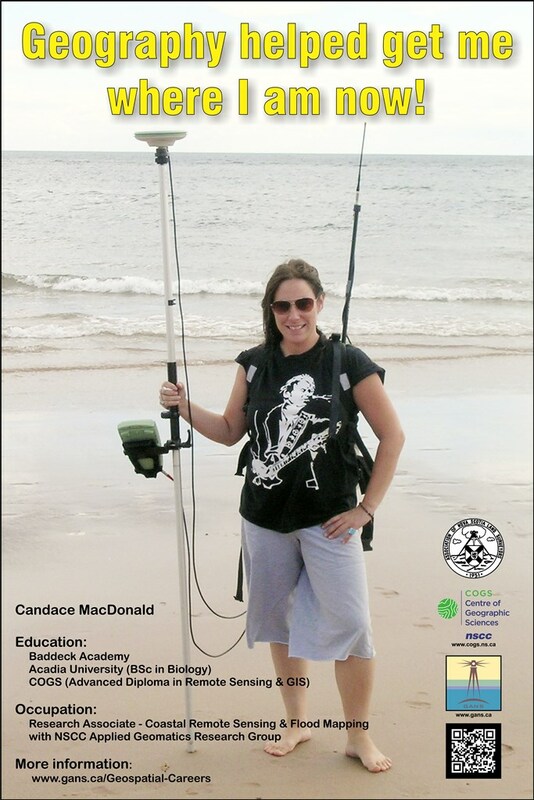 Since 2010 I have been employed in the Annapolis Valley with NSCC’s Applied Geomatics Research Group as a Research Associate for Coastal Remote Sensing & Flood Mapping. I use remote sensing technology such as satellite images and LiDAR 3D point data, combined with GPS technology, to make and study very detailed, spatially accurate models of the earth’s surface. We collect this data for various purposes related to the coastal zone, such as flood risk and erosion mapping, or habitat mapping of plant and animal species. My job is a mix of office and field work, which takes me to Maritime beaches and rivers on boats, in planes, and on foot to collect data, then back into the office to use specialized computer software such as ESRI’s ArcGIS to analyze the data and make maps to answer the questions we started with. Most recently, I worked with one industry partner to map a certain kind of seaweed using high-resolution multispectral satellite imagery. In another recent project we determined extents of flooding from sea level rise and storms on Halifax Harbour, and how many roads, railroads, and buildings will be affected in the event of higher water levels. My job in the Geomatics industry is fun, interesting, and I’m always learning new things!